The first land purchase using Community Preservation Act funds was the 3.6-acre George Souza Preserve in Hatchville. The town bought the property from George and Barbara Hampson at the end of 2006, with a significant contribution from The 300 Committee and a $10,000 grant from the Cape Cod Five Foundation. 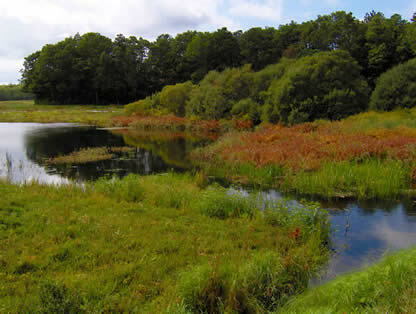 The wooded parcel slopes down to a vernal pool and the Coonamessett and Broad Rivers. It abuts The 300 Committee’s Toner parcel. Both offer an unusually wide variety of habitats within a short distance and protect a green buffer along rural Hatchville Road. Mr. Hampson requested his land be named in memory of George Souza. The long-time Falmouth shellfish warden, who died in 1999, worked closely with Mr. Hampson in the aftermath of the spill from the barge Florida that washed 189,000 gallons of fuel oil into the marshes of West Falmouth in 1969. The shellfish warden had to fight to win compensation for the town for the damage to the rich shellfish beds in West Falmouth. Although trees and briars have filled in the property, remnants of the past remain: a few apple trees from the days when a previous owner had an orchard there and a tall cedar of Lebanon planted as a sapling by Mr. Hampson. The best way to reach the preserve is from the cranberry bogs along the river. Parking is available at the Matt Souza Conservation Area on the north side of Hatchville Road and the dirt road that leads to the bogs and the Air Force plume treatment facility on the south side of Hatchville Road.